Delicious and easy! I really like starting with raw shrimp, but I'm thrilled that our grocery store gets a brand that has already been slit and deveined! Love the shells...don't like cutting the vein out. Ick. 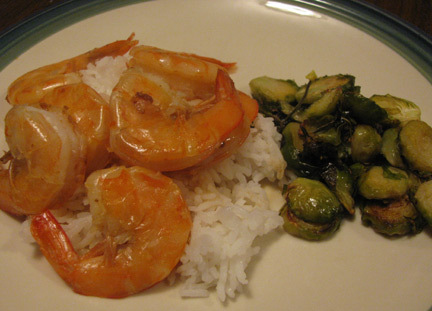 We had these shrimp with jasmine rice and roasted sliced Brussels sprouts. Dry the shrimp off with paper towels and season them with salt. Heat a bit of oil in a non-stick skillet over medium high heat. Cook the shrimp on one side for about a minute; aim for brown spots. Remove to a plate. Cook garlic in 1 T butter over medium heat, just until fragrant. Stir in liquids and bring to a boil, scraping up browned bits. Cook until sauce is reduced by half, about 5 minutes. Return shrimp to skillet, hit with hot sauce and allow to simmer for about 2 minutes. Off heat, stir in 1 T butter and serve. Dora the Explorer hosts a birthday party!